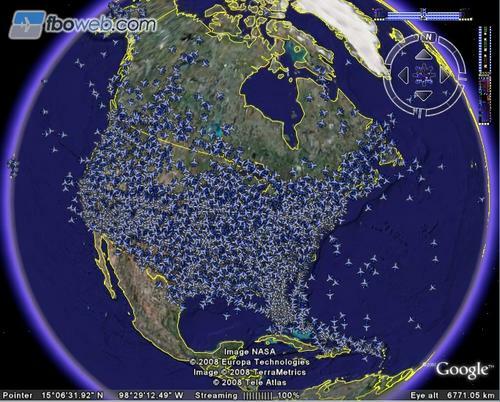 A friend of mine asked me recently whether I knew that it was possible to view real-time air traffic in Google Earth. I had to admit that I never heard about this before, the only thing that came close to it was a website where users could listen to live air traffic communications. He send me the link to the website which offered this service and told me that he was currently tracking a flight of a friend who was vising New Zealand. I obviously had to download had to download Google Earth to test this application but after that everything went on smoothly. Users have four options which are all accessible from the main page. The first is to load an hourly snapshot of all active flights (over the United States) into Google Earth, the second to load the latest flight incidents into the software, the third to view the live inbound traffic of a selected airport and the last to track a specific flight of an airline that is available. I do not have that much experience with Google Earth but was not it possible to get into some sort of 3D mode in there? Update: Flightwise has updated their service in recent years. It now offers both realtime 2D and 3D air traffic information. When you open the website you can select an airline and enter a flight number to retrieve information about that airline. You can alternative check up on popular airports and pick one of the planes that is about to take off or arrive there. Once you have selected an airplane, you are taken to the detailed view page where you see the plane's path on a map. Here you also get additional information, like the estimated departure and arrival time, logs, and current flight details. So very utterly impressive! And a huge waste of time too. Lovely. nice to track a flight of a friend and to get informed of any delay. It is extremely annoying, taking up valuable screen space.